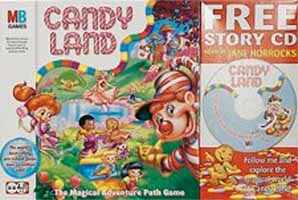 Candy Land is a game for the very, very young. It's very simple, all you have to do is draw a card and move your token to the next gameboard space that matches the colour on the card. Race towards the rainbow-coloured finish and Candy Castle. The first player to reach the castle wins. And that, in a nutshell, is it. 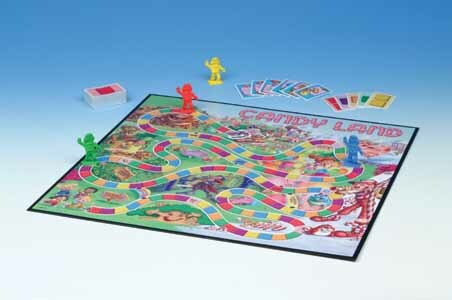 Unlike other childhood favourites, like Snakes & Ladders, there is no punishment or forfeit involved in this game. You never move backwards, only forwards. No doubt this is a modern American game that is designed to not stunt the emotional growth of the very young by punishing them when they do wrong. No, much better to reward the child at every turn. That's fine, but if you follow that argument then you are creating a game where one child wins and others loose - so what is that teaching our children? That they are worthless if they don't win? Yes, a silly argument I know, but then I was hoping there might have been a bit more of a challenge for young players. As an introduction to boardgames this is enjoyable, but for an children who a little older, you'd be advised to stick to Snakes and Ladders - at least that is a little more challenging.